MQF! MQF! MQF! There is a glitch in the matrix. I can do lots of things. Wiggle my pinky toe, sleep with my eyelids partly open, embarrass my children with a single dance move, but I can't bend a spoon. Mr. Floozy can! He can also open pickle jars. I've seen 'Drag Me to Hell' so I know a Gypsy Curse is pretty bad. Luggage tags! For your suitcases, backpacks, MacGuffin briefcases, and children! if you harm my stuff i will GYPSY CURSE you! They are so pretty. And dangerous. The 'backside.' Where you put your info, just in case whoever robbed you also wants to steal your television. This time I really REALLY fixed it. Really. Remember last Friday's movie quote that made your eyes seizure? Well, I fixed it! It's fixed, right? TELL ME I FIXED IT. WARNING: May cause hallucinations, blindness, or spontaneous singing. Mini Floozy's Movie Quote Friday! As you all know, since I overshared personal information, I recently had a surgery. One of my friends watched my kids for a couple of days. She was appalled that they had never seen the movie Clue or played the game. I admit to complete parental failure on account of the movie, but not for the game. See, we played the 'Jr.' version of Clue called 'Who Ate The Cake.' A game supposedly safe for children since it doesn't have a murder. But it does have a criminal who dares to eat all the cake. CAKICIDE. Dun dun dun! I am your singing telegram . . . BANG!! I was commissioned recently to make another Bathroom Birdie. Not just any bird, but an OWL, and not just any size but a big "12 hoop sampler. I am a pretty pretty bird. The Owl does not lie. Notice how the flower petals falling represent the second half of Daphne's insult. It was well-received by the parents, but not so much by the daughter. I would have expected nothing less. I'm all about creating tender moments and beautiful family heirlooms. Why I am So Late . . . .
My friend bought me this adorable plushy. 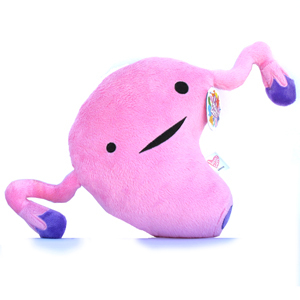 Yeah, it's a uterus. She got it for me to replace my old one. It's gone, people! Hysterical-ectomy! I'm not sure if this makes me an old woman or a man or both, but what I do know is that I am extremely allergic to percocet and that I haven't been able to craft much. And today is 'spose to be Mr. Floozy's Movie Quote Friday. I know! If I were to stitch a quote for today, it would be this one (perfect for my guest bathroom!) that Mr. Floozy always quotes from Summer School. This menstruation thing? It's a scam! Women are so lucky! It is summer time. And I am a vampire. Well, vampiric. I'm not really into the blood-sucking thing and I think that's a requisite. Soooo, I took this medicine a couple of years ago, and the doc was like, it may cause yadarashyadasunyada. So now basically when I go out into the sun, I get a rash. It even has a name: polymorphous light eruption. I don't have it as badly as I used to. I no longer start to sizzle as soon as I step out of the shade. BUT, I am still not a real big fan of the daystar sun. I would totally unfriend it if we were on facebook together. I could be trendily romantic and walk around with a parasol while genteelly touring my country estate, but nah. I think that a gothasol is much more subtle. Hopefully by now you have figured out that gothasol is a portmanteau of the words "goth" and "lonely." Hold onto your decorative chainmail, goth peeps, cuz I'm going to show you how to make your very own GOTHASOL. First. Buy an umbrella. A black umbrella, duh. Next, get together a bunch of black crafty crap. Yes, I have multiple junk drawers. I am now assuming that you are an AMERICAN and own a glue gun. It's like the second amendment, yo. Glue gun the trim around the perimeter of the umbrella. Free Hint: measure out your trim before you apply. It's like some gauzy material covered with a layer of lace which is covered with some silver studded stuff. Done! Your gothasol is a work of art. Make sure you take it with you every time you go outside in public. The Daystar wants to kill me. Excuse me while I laugh creepily for five minutes. Okay. All better. If ever in the far, far distant future I am on the market (don't get too excited Mr. Floozy), I really hope this website exists so that I can check that box. Meanwhile, I have this. Hang me on your doorknob! These won't be available on my Etsy store for awhile, but I will be selling them at Craft Lake City. Mama Floozy's Movie Quote Friday -- O Brother, Where Art Thou? Today's movie quote comes from my super lovely mother. She likes a lot of weird movies. 'Finian's Rainbow,' anyone? Luckily, when I asked her what her favorite movie was, she answered with 'O Brother, Where Art Thou.' A classic! And teeming with worthy quotes. This is perhaps one of the best. A family favorite. Good for all occasions. Use it on your English teacher next time she asks you why you didn't finish your book report. She will love you for you impeccable grammar and your knowledge of transmogrification. Make sure you drawl this out slowly and dopily.